Last month, just when I was itching to write another timely op-ed, that guy who “lives” in the White House opened his mouth. Again. This time, he insulted the Paralympics. You know I’m going to speak up for the disability community. Again. 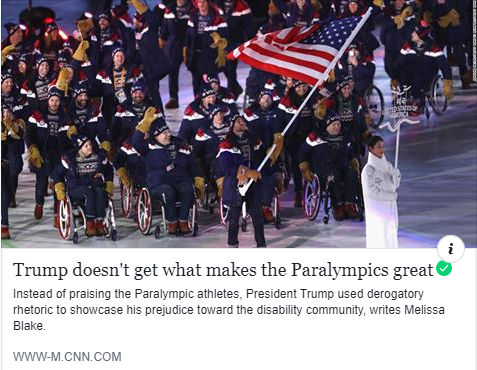 After Trump’s ableist comment about the Paralympics, I wrote an essay the very next day because I had so many thoughts swirling in my head and I just had to get all the words out. “Which is why to go from calling the athletes “incredible” to downright insulting them in the very next sentence is nothing short of dangerous. By saying it’s tough to watch, Trump is invoking that archaic stereotype that people with disabilities shouldn’t be seen — that they make people too uncomfortable to be out in public. And speaking of Trump and CNN, he recently tweeted that CNN is “dead.” So, naturally, I tweeted him all of my op-eds with the hashtag #CNNIsAliveAndWell. Love Lounge: Would You Date Someone With A Disability? Letters To My Future Husband: Letter #132. Love Lounge: And Then He Kissed Me.